ePic2 is a complete framework to command the e-puck within Matlab. It allows its user to interact with the e-puck as he would do using the Windows' Hyper Terminal but improves on it by allowing the data gathered by the robot to be used as variables for Matlab's tools. ePic2 can be used in two ways. The first is through its graphical interface that can be seen below. The interface offers basic commands over the e-puck and displays the values of the sensors. It also provides a way to execute controllers written in a M-File. The second method uses Matlab functions to command the robot from the Matlab's command line. This offers more control compared to the interface. ePic2 is available on the e-puck svn in the tool section. It requires Matlab 7.1 or higher equipped with the Instrument Control Toolbox installed. It is nevertheless recommended to use the most recent version of Matlab to avoid some stability issues. Currently ePic can be used under Windows and Linux. It does not work under Mac Os as the necessary functions to connect to the e-puck are not supported on that platform. ePic2 and its documentation can be found in the download section but it is highly recommended to download them from the tool section of the e-puck svn as it may contain a more recent version. ePic2 is used for education purposes at EPFL in the course Mobile Robots. ePic is the main tool used for every exercise sessions whose details, including exercise sheets and source codes, can be found on the course website. 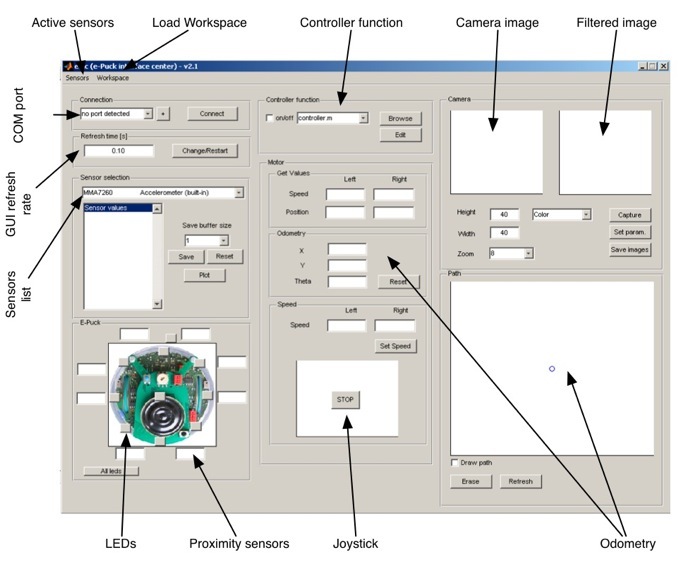 This software was developed at the Laboratory of Intelligent Systems at EPFL by Yannick Weibel, Julien Hubert and others contributors.